Right on target! I love it. "In my life, I think the difference is simply aligning my dreams and desires for my life with the will of God and His purpose for my life." 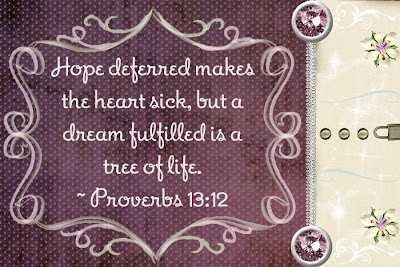 When our dreams line up with His, we will never be disappointed. Happy WFW! Ohh that all of my dreams would be God's dreams for me! What a great reminder to keep our eyes fixed on Jesus and in His Word so that we can see and hear the dreams He has for each of us! This verse makes me think of Sarah and how she waited 25 years for the promised son, Isaac. 25 years...but God is faithful and when He promises He will bring it to fruition in His timing. Have a blessed day! Sometimes its hard to say "Thy will be done" and mean it. But I find that when I do His plan is always bigger and better than anything I ever dreamed about. Thanks for the thought. And thanks for stopping by my blog. Terrific devotional! You said it-- if God dreams it for us, it will happen! Such truth here, Tracey. Those dreams are so important, and aligning them with the Lord's will can make all the difference! This is beautiful and I agree -- the key is making sure that your dreams are the same as God's purpose for your life. Your blog is beautiful and I have to say that I spent a LOT of time reading your 100 verses. I'm finding that I'm not as well-versed (pardon the pun!) in the Bible as I thought I was and I'll be back to reread those and read the chapters and verses surrounding them. Everything changes when you say..."Ya know God, this is what I want, but I want want you want~no matter what." Yes, if we delight ourselves in the Lord, and make His Kingdom first, God will meet the desires of our hearts...but in His time. Knowing that makes all the difference. Great post`full of wisdom and truth! A great big amen sweetie. Love it... Thank you for sharing this great post. It does make a difference when we line our wills and our desires with those of God doesn't it. Great post Tracy. I am still dreaming and praying but I am resting in His perfect will. Also wanted to let you know you've been tagged. No problem if you've been tagged already. Stop by my blog when you get a chance. Amen! I have had dreams come true and some that haven't. But I will Keep hanging on and hoping that in His perfect timing He will bring others to pass.. If i am not praying in accordance with His will i ask Him to reveal that to me so that i may know. His will is what is best for me and not my own.. Your Kingdom come and your will be done in me... Thanks for sharing Tracy.. God bless you! His plans for our lives.